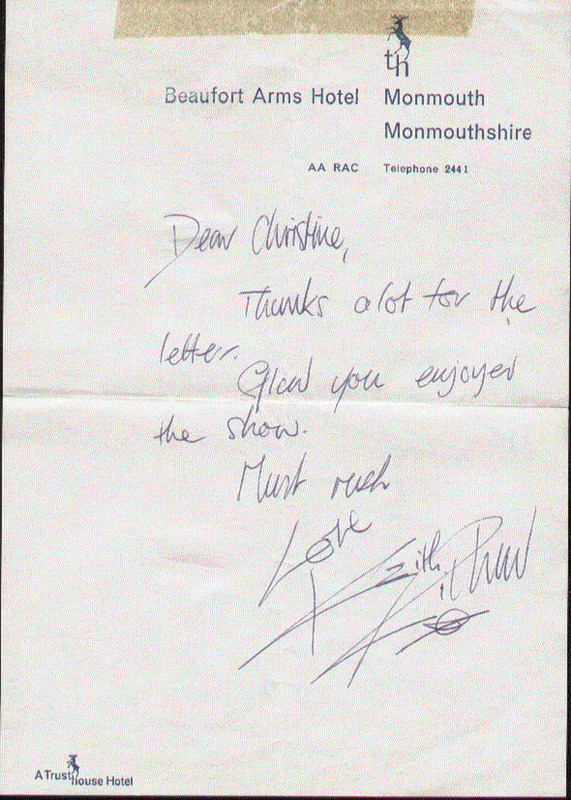 Autographs are supplied as shown with or without the display mounts in the sizes described on the website. These display mounts are supplied ready for framing. The overall mount and autograph aperture sizes are shown in the item description. Any autograph can be easily removed from its display mount and sold loose at the customers request. 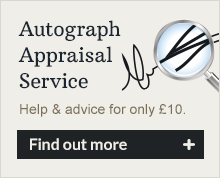 Any loose autograph that is shown on the website and marked as “suitable for mounting” can be display mounted with photograph (or any relevant item) to the customers specification or as required. Contact me for a quote if you would like us to provide this additional service for you. WE TRY TO SHOW accurate images of all of our products and always close-ups of the autographs themselves. However some of the images of the larger mounted displays are too large for our scanner so are shown cropped or missing some borders and photographs. If you do need to see additional images of any stock item please contact us and we will endeavour to do this. * Prohibitively high cost of shipping and risk of damage (especially overseas). Glass is not insured by most couriers. * Customers personal preference for frame type and colour needs to match the environment the display is ultimately being hung in. * The autographs are locked in, are no longer tactile and harder to authenticate. * It is always far safer and more economic for the customer to get framing done to their own specification on arrival. * Framing “done properly” is a very specialist area. We strongly advise high value memorabilia / autographs to be professionally framed using all acid free products and low UV glass to avoid longer term fading, condensation issues and potential damage. A good framer will protect your investment. * Many of the so called “beautifully framed” displays that you might see / find in high street memorabilia shops, at charity auctions and on US websites covers up the fact that many of the autographs within are not authentic. The cost of the framing often exceeds the value of the autograph inside. The buyers judgement (especially when viewing framed-signed sports clothing) can become influenced and clouded by “the look” of the piece. Do not forget that 90% of the value / desirability is in the autograph itself. We will post your order direct to Speedframe on your instruction. You will then liase with them direct in regards to all aspects of your framing requirements. You can let them know that you have been referred to them by Memorabilia UK and this should help get you a preferential framing rate. You will pay all costs and arrange delivery of the item to yourself direct with them. Memorabilia UK are not involved and do not receive any financial reward from this process.